We are getting to the very end of our state food tour —only 2 more states to go after this one. I am confident that Illinois—the home of Chicago-Style Deep Dish Pizza—was by far the easiest state meal to make. And I made it perfectly. I only wish the children would have eaten it. Not that they don’t like pizza—as typical teens, pizza may be one of their major food groups. No, one is battling some upper respiratory infection and has no appetite and the other was at a school event the night I made the deep dish pizza. Ironically, they served pizza there. I sent her pictures of our delicious meal; she sent me pictures of their wimpy school pizza with the middle finger emoji. I almost felt like I was cheating. Well, in a way, I guess I did. I did NOT make the dough from scratch. I had leftover dough from our Super Bowl Appetizers so why reinvent the wheel? Why make things more difficult for myself when I can barely boil water sometimes without incident? Also, I did not make my own sauce or mozzarella. Yes, people make their own. I don’t know why—I barely have enough time to get to the store to buy mozzarella and sauce, let alone make it. Actually, once upon a time, I did make my own sauce using my great-grandmother’s recipe and it was quite delicious. But the kids don’t appreciate it and they refuse sauce on their pasta most of the time. *This is an affiliate link which means if you should click on this link and make a purchase, I will receive a commission at no cost to you. Add about 1 TBSP of olive oil. According to The Minimalist Baker, you need to run a clove of garlic around the edges for flavor. Place dough in skillet and spread out about an inch thick, pushing the dough up the sides. Finally add whatever toppings you like. Bake for about 30 minutes. Check around the 25 minute mark to make sure it’s not burning. 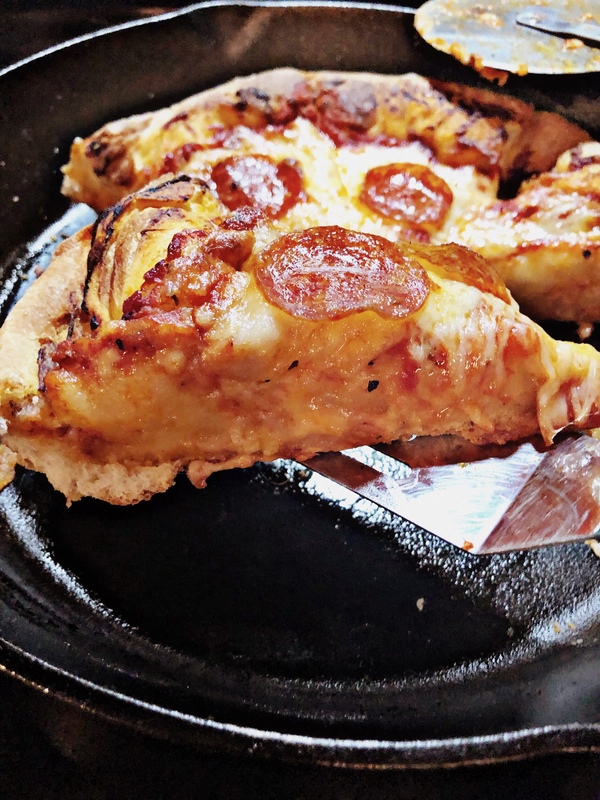 Most Chicago-Style Deep Dish Pizza assembles the pizza “upside down” with the sauce on top and cheese as the first layer. This is to prevent burning of the cheese. But I don’t like my pizza that way and this is my blog so I can do what I want 😉. We had leftovers, but of course my fussy children will not indulge in leftovers no matter what they are. So picky. This size would be fine for a family of four for dinner. Or a family of three if you have teenagers. 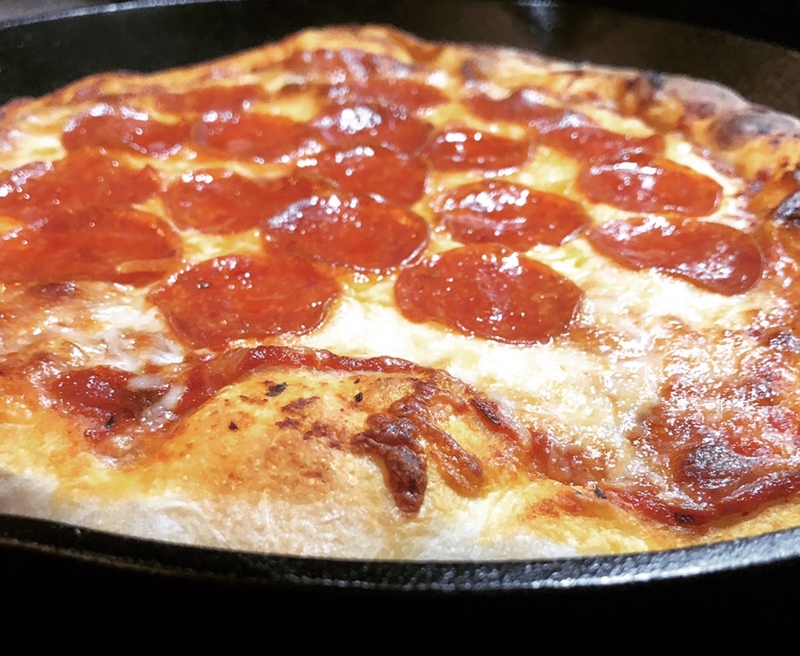 I can’t believe my teens missed out on this pizza. Oh well, there’s always next time.